Dodge City, Kansas - I have found that I do some of my best thinking with a windshield in front of me. While I was over-the-road trucking this spring, I started to daydream about the different features a truck could have that would make life in a truck that much more enjoyable. Mind you, most of these things are pure imagination but it's certainly a place to start. A holographic barista that will prepare you any coffee drink known to man (bring on the espresso). Autopilot -- that's got to be close on the trucking horizon, don't you think? To go hand in hand with the autopilot, the driver's seat should swivel so the driver can easily move in, out and around the seat/cab. A little more about this seat... it should also have the capabilities of a high-end massage chair -- one that actually relaxes you and doesn't leave you in a bigger pile of knots than when you started. In the sleeper, there should be a button you press that slides the solid roof of the sleeper to one side to expose a starry night. A giant flat-screen TV that folds down from the roof between the main cab and sleeper. If there's autopilot, there's plenty of time to catch up with your Netflix-ing. Blow a tire? A motor? Maybe an alternator? No worries -- the truck will notify you when these things happen, slowly get you to safety and fix itself. An interactive motherboard that could do anything from teaching you a foreign language to reading you books (in different voices per character) to singing you a lullaby before bed, making the time over the road that much better. The ability to change colors anytime. Tuesday could be purple; but maybe by Friday you're feeling more adventurous, and you want it to be camouflage. Wheels that turn into propellers so the truck can go underwater. This serves absolutely no purpose -- just sounds super cool. 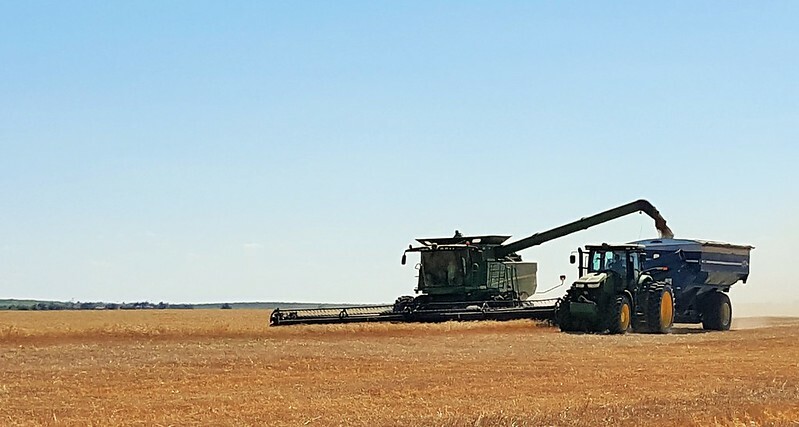 Goodland, Kansas - We’ve been busy harvesting wheat since May and will be busy for a few more weeks; but I am sorry to report that after we’re finished cutting wheat in Kansas, Colorado and Western Nebraska, we’re not sure what we’ll have to cut up north. South Dakota, North Dakota and Montana are in a severe drought and there are reports of no winter wheat at all and the spring wheat is going to be a really sorry crop this year due to the drought. Harvesters have to have income to make payments. If there is no income, payments are not made. Harvesters count on Montana and the Dakotas for big acres and yields to complete their summer wheat run. Custom harvesting is certainly a risky business to be in due to Mother Nature - no doubt about it. Mother Nature can be so good, but she can also be so bad. One bad harvest run can ruin a harvester’s business. This drought is seriously bad for us harvesters. We’re all stressed out just thinking about it. No joke, I even had a report of freeze damage in South Dakota on June 24th. Crazy, I know. Whatever wheat turns black is a result of the freeze damage, so you just have to wait and see what areas got hit. We'll know what we've got when we get up north later this month. 06 Jul Tracy: Now what? Garden City, Kansas - My oh my... the days certainly run into each other, and the weeks are gone before you know it! We left home four weeks ago this past Sunday (7/2). Seems like a whirlwind of events since we pulled away from the driveway as Taylor and Jenna were waving goodbye. 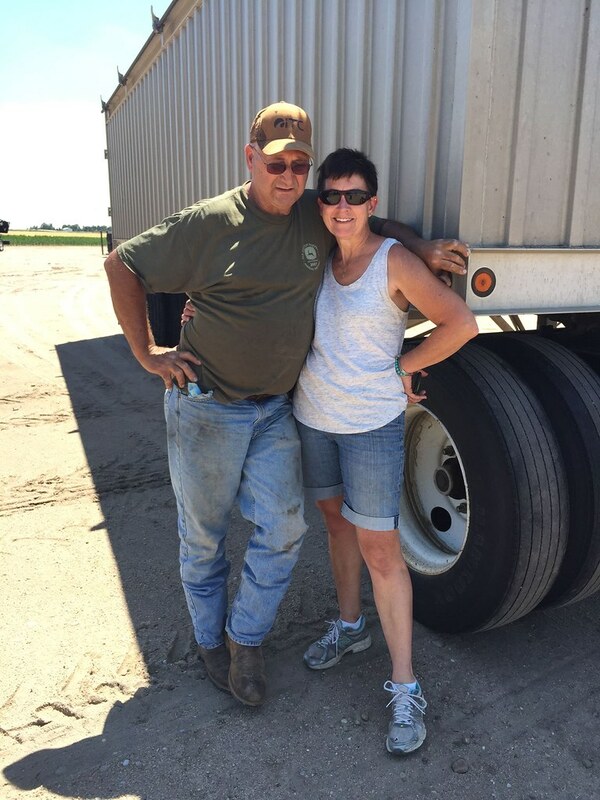 [caption id="" align="alignnone" width="768"] Because it's what harvesters do! (Photo credit: Nancy Eberts)[/caption]So, let's have an update. Dodge City, Kansas - Once the harvest stops in Kansas have all been completed, the rest of harvest becomes a blur. I was thinking today how far we have come as a crew. I say this in the sense of a rhythm - a groove that a crew gets into. Everyone gets acclimated to how everyone else works, and things just go smoother. The farmers in Texas versus the farmers in Nebraska see two different crews. We were able to finish up in Dodge, and we will be heading to our fifth stop on the harvest run - Sidney, Nebraska. We brought one of two combines up here today, and the wheat is still a bit green along with the inch of rain the area received this afternoon (07/03). The wheat we cut in Dodge ran anywhere from 60-100 bushels per acre, and the test weight averaged 60 pounds. That being said, Farmer Chris here in Dodge City bid Anderson Harvesting off with an awesome barbecue for a job well done. There were hamburgers, brats, brownies... you name it. Farmer Chris' wife, Eileena, made some of the most delicious potato salad I have ever had in my life, and the evening was full of laughter and conversation. Goodland, Kansas – It’s been early mornings and late nights (also known as 24/7 eat, sleep, truck and combine) for many consecutive days now. You won’t hear me complain though. I hope it continues. Working makes me happy and is when I feel my very best! I feel blessed to have the ability to work and make an honest living in this great country. Having the opportunity to get to work all day every day is amazing. I'm happy to share what I’ve been seeing out in the Kansas wheat fields. We were in the Dodge City area and had wheat cutting weather for the most part, including heat and humidity under 50 percent during the day. We did get sprinkled out with just a few rain drops three evenings in a row. However, an early evening in from the field is always an excellent opportunity to catch up on rest, even if it is already 8 or 9 p.m. The wheat was pretty good again this year and yielded in the 50 to 70 bushels per acre range, and almost all of the test weights were 61 to 63 pounds. I did harvest a field that didn’t yield so well due to mosaic disease. It is a major problem and causes significant yield loss. My Office - Throughout the last several weeks, there has been talk from the bloggers about a disease that has been affecting the wheat. I know our All Aboard readers are a diverse group, so I thought I'd offer a little "Wheat 101" mini lesson for those who may want some more details on what we're talking about. If that may be you, keep reading. If you're comfortable with all things wheat, you can skip this one and resume with the next post! So what is wheat streak mosaic virus, and why is it such a problem? The reason it's a problem is because it can cause significant yield reduction and cannot be treated or cured. This virus is spread by a tiny insect called a wheat curl mite. You can see a picture of it here. There are wheat varieties that are resistant; but over time, the mites can adapt, and the variety may become susceptible. The best treatment is making sure volunteer wheat in your area is taken care of, or in other words, destroyed. 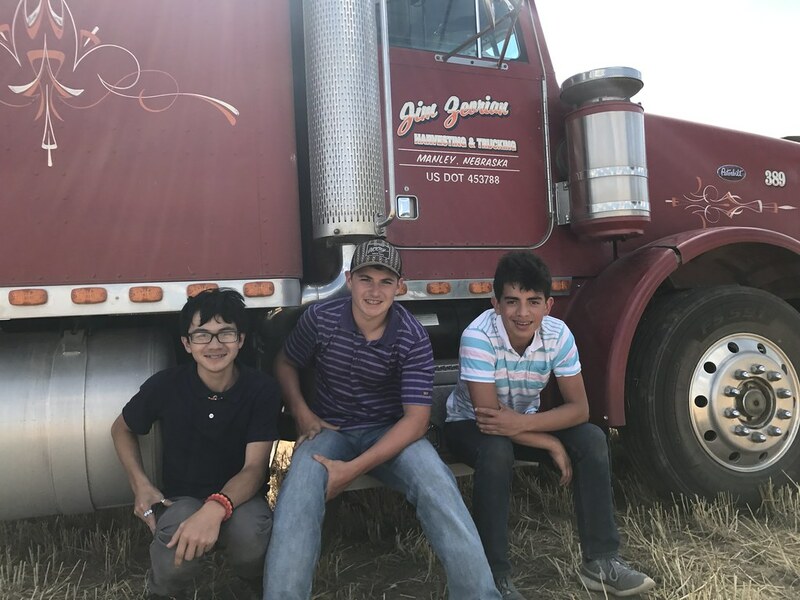 Garden City, Kansas - The day the boys from the Oklahoma Baptist Homes for Children came to visit the field will be one of my most favorite memories of the 2017 wheat harvest.